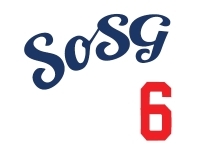 With the World Series just completed, here at SoSG we’re pleased to announce that we have teamed up with TiqIQ to bring you the “Rookies” app World Series contest. 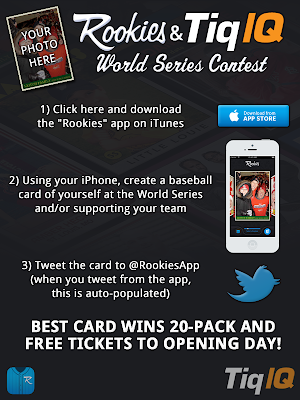 Enter to WIN OPENING DAY TICKETS from TiqIQ.com to a game of your choice + a FREE 20-Pack of personalized baseball cards. Check out the image for the contest entry details... It's 3 easy steps! If you don’t know, the “Rookies” iPhone app allows you to create your own baseball cards. The front and back of each card is fully personalized with custom photos, text and color. Once created, users can share them socially on Facebook and Twitter. After customizing your cards, users can purchase a pack of their cards, which are printed on premium-recycled stock that come wrapped in a custom wax pack. Each pack contains 20 cards and you have the ability to choose to receive 20 of the same cards, or create a collection of your own designs and get a pack of all cards in that collection. TiqIQ is a leading live event ticket search engine with a singular mission to make buying event tickets more transparent, efficient, and simpler. We deliver on that mission each day by providing ticket buyers with real-time information on the latest price trends, and access to the best deals from all sellers--for any event. TiqIQ also allows you to Sell tickets using their totally free service, Seller Direct. Also, for a full update on ticket prices for events of all kinds, visit the TiqIQ blog.